Cody Hicks submitted this photo and caption. Age-outs from 2008 Cody Hicks and Christina Wixom. Christina played trumpet for Phantom Regiment in 2007 and 2008, and I marched as a snare drummer at Blue Knights in 2007 and 2008. Although we marched separate corps, we dated through it all and are continuing our sixth year together. 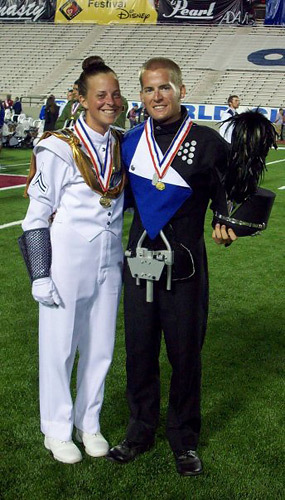 This photo is from the World Championship Finals after Phantom Regiment won first place!